"Girls" follows four beautiful women and depicts the troubles found in their love lives and work place. Yukiko Takigawa (Karina) works at a big advertising firm and has a good looking boyfriend (Osamu Mukai). Seiko Takeda (Kumiko Aso) is married and has no children. She works at a large real estate company. Yoko Kosaka (Michiko Kichise) is a single woman working at a historic stationery company. Takako Hirai (Yuka Itaya) is a single mother who works for a car manufacturer. 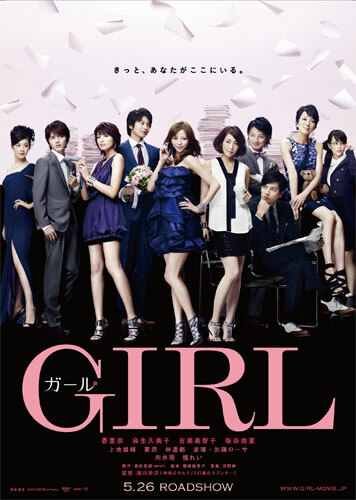 Based on the anthology novel "Girl" by Hideo Okuda (first published in 2006 and sold 300,00 copies up to mid 2011). The anthology novel "Girl" consists of 5 short stories and the movie version contains 4 of those short stories. Aileen Aug 24 2013 1:09 pm Excellent show! Power to us Girls!!!! Jared Aug 31 2012 5:23 pm I saw this on an ANA flight from Tokyo. Such a great film that captures so much emotion. Definitely a must watch. Ray Apr 30 2012 2:26 am Michiko Kikisei!!! her thrilled Face!! Priceless!!! Sarah Hayashi Apr 12 2012 2:17 am i want to watch this….so much!! <3 kento-kun!! Sarah Hayashi Apr 12 2012 2:17 am i want to watch this....so much!! <3 kento-kun! !